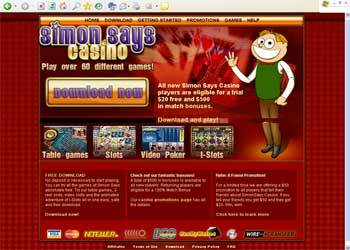 Simon Says Casino has Great Games and is a lot of fun to Visit! Play their Interactive Slots and Thrilling Table Games. Simon SaysCasino as Presented by Gambling World! The all new Simon Says casino has gotten quite a bid of press recently. Exploding on the Online Casino market late in 2007, they offer the internet gambler a nice selection of games to play from home. Utilizing software from Rival Gaming, the list of games is well over 60 at present time and growing larger all the time. Players have the choice of playing table games found in most casinos such as blackjack, baccarat, war, craps roulette, keno and more. They haven't forgotten about video poker either. More than six varieties are available so you can be sure to enjoy a round. But the real exciting part of a Rival based casino is the unique slots that are offered. They have traditional three reel slots with names such as Chicken Little, 7s and Bars, Gold Rush, Fruit Slots and more. They also have a nice selection of over a dozen Video Slots such as Hobos Hoard, Atomic Age, Ocean Treasure, and one of our Favorites "Reel of Fortune". And it doesn't stop there. The most unique slots offered at any Rival Software casino are what is called "i-Slots". Doubling the entertainment value of any ordinary slot game, i-slots are multi-reel, multi-line slots with a bit of something extra. There are really cool extras like animated video clips, interactive bonus rounds and they follow a unique story line that gets you really involved in the game. As you play the i-slot, the story continues to unfold, and depending on your skill and the choices you make the outcome of the game is different each time you play. When you are ready to make your first deposit in the casino, you will be given a 100% deposit bonus of up to $100 Free! If the $100 bonus wasn't enough incentive, there's more. As a first time new player to Simon Says Casino, you are offered a $20 Free Bonus to try out the games. This is an extremely limited time promotion and could be withdrawn soon, so take advantage now, and join today. Visit This Is Vegas Casino Today!